In 2008, a crossing guard named Diane Sharp pushed a student from an ongoing dump truck, saving his life. The second grader of an Ohio Elementary school has fully recovered because of this courageous and selfless act. Freedom from danger was not an issue when Laura Ingle from the television show, “Little House on the Prairie” walked to school each morning, other than maybe tripping over uneven ground. The external factors have increased significantly, therefore, decreasing our children’s overall safety. Parents will begin driving their children to school alleviating personal anxiety while increasing the emissions on school grounds and also missing this opportunity to benefit from fresh air and exercise. Child obesity has tripled in the past 30 years because of eating habits and technology. Obese children are more prone to develop high blood pressure and cholesterol, sleep apnea, type 2 diabetes, and social and psychological problems where the unhealthy cycle starts all over again. Crossing guards have long been a second set of watchful eyes looking out for our children’s safety. They greet our children with warm words, scold them for unsafe behavior and protect them from suspicious activities, giving parents a peace of mind. Crossing guards Prevent many potentially harmful acts upon our children. Will crossing guard posts be replaced with banners and signs saying, Drug Dealers are Not Tolerated”, “Abduct my Child and Face My Wrath”, “Bullies Better Beware”, or “Speeding Cars will be Prosecuted”. Crossing guards have a very important role assisting parents in the care and nurturing of children. 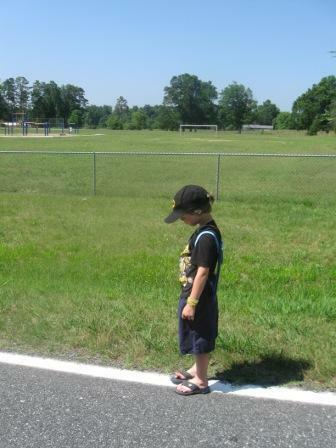 Parents are unable to view all aspects of their child’s social interactions where as crossing guards help guide children from their homes to their schools with minimal negative activity. Their job is much more than moving from point A to point B.